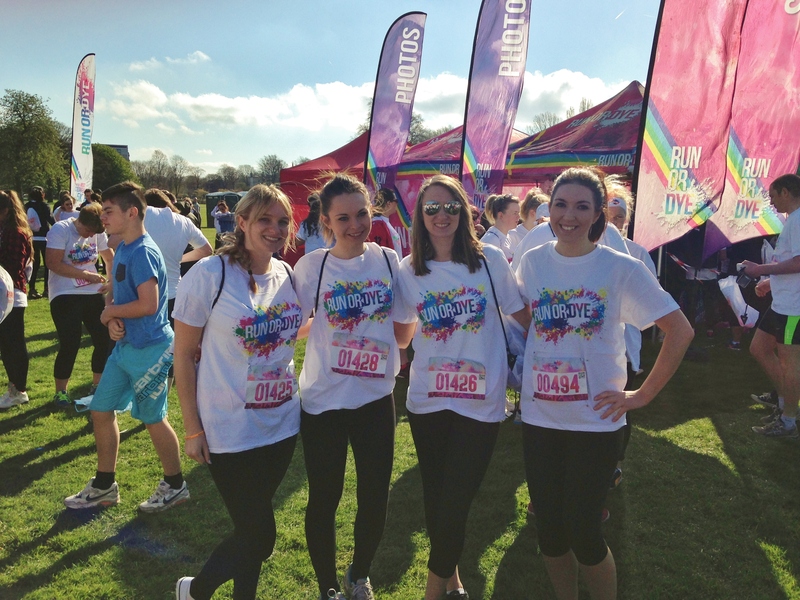 I posted a few weeks ago about signing up to do Run or Dye (the UK’s most colourful 5k, don’t cha know!) and last Saturday the day finally came where I got to reveal my true colours! The event couldn’t have taken place on a more perfect day, the sun was shining, the temperature was mild and there wasn’t a rain cloud in the sky. 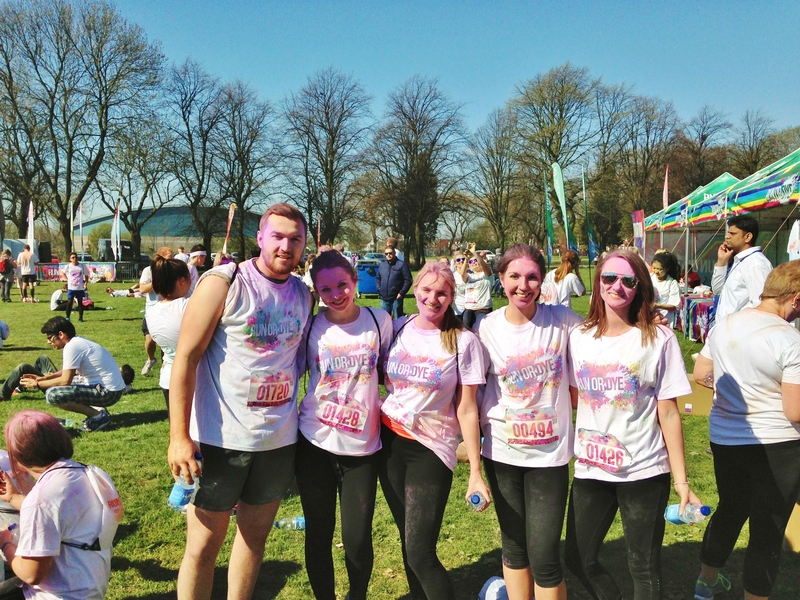 As I walked into Platt Fields Park, it felt like festival season was truly in the air, and there were queues of squeaky clean runners dressed all in white as far as the eye could see. Once I found my friends Emilie and Emily, registered and got my white t-shirt, I was ready to go. As well as a t-shirt everyone got a little white backpack (very circa ’93) which had a sachet of dye and a transfer tattoo – which I obviously botched up, so I was more “Run or Rye” than Run or Dye – to build our colourful look. 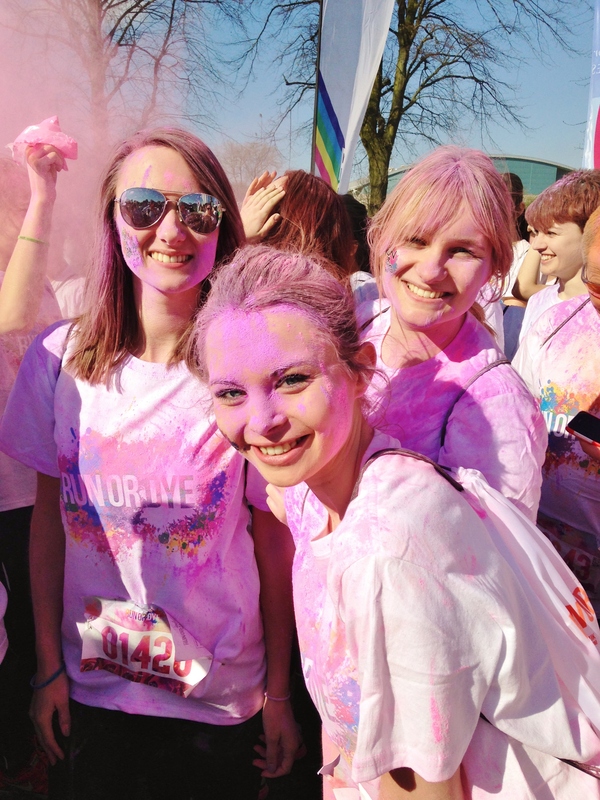 We immediately opened our packets of colour and started throwing it around everywhere, our clean white outfits immediately disappeared into a cloud of pink, lilac, orange and blue smoke. The dye was chalk like, so I didn’t mind people pouring entire packets over my head (which they did!) as it didn’t hurt my eyes, although a lot did end up in my mouth? As it was only 5k, the run itself wasn’t very challenging, but I’ve got to admit that running in a huge colourful cloud of smiling faces was such an amazing atmosphere that it didn’t really matter how difficult or easy the course was. Overall, it was a brilliant experience! 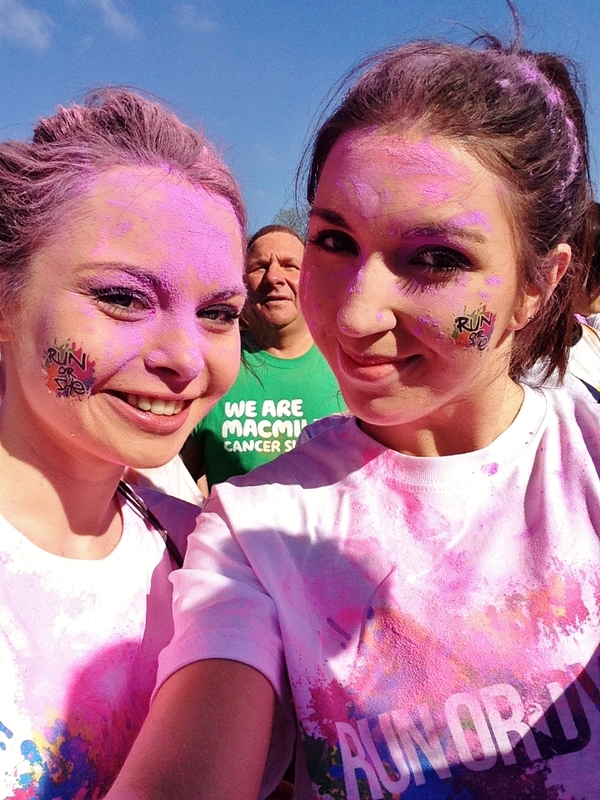 I thoroughly enjoyed the vibrant atmosphere and positive vibes that Run or Dye had to offer. It didn’t feel competitive at all, more like running with a massive group of friends or family. 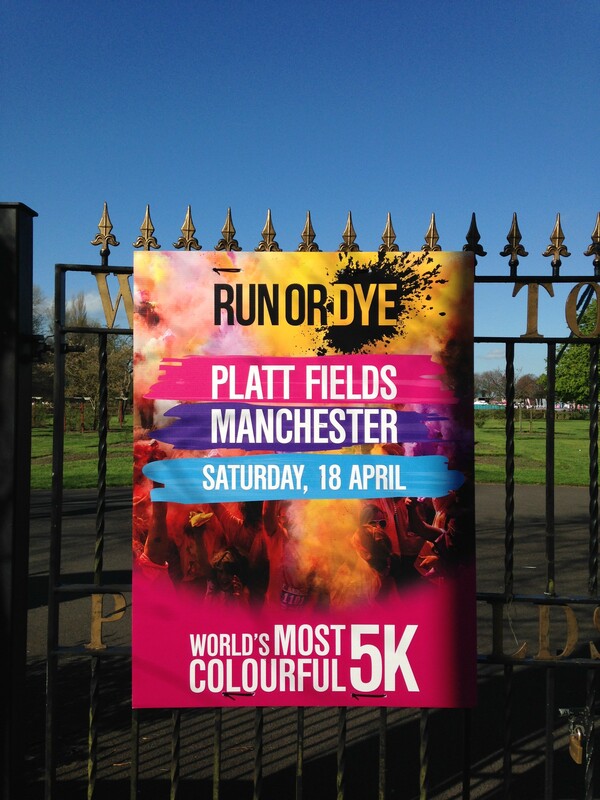 Although, I probably wouldn’t do another one in Platt Fields Park, as it’s quite an easy route, I will definitely keep my eyes peeled for any other colour runs in different locations. However, the event didn’t have a bag drop or lockers to put your things in, so I had to carry my jacket and bag with me during the entire run which was a bit annoying. 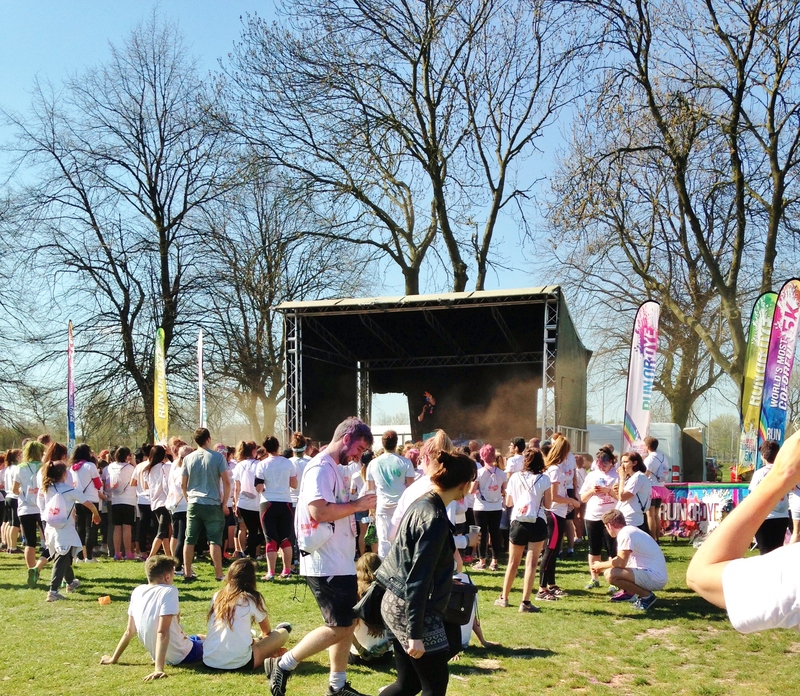 So if you are doing Run or Dye make sure you don’t bring anything with you that you wouldn’t be able to run with, I saw quite few people struggling with huge rucksacks along the way. One final note…I also chose to walk home after the event (which takes an hour directly through the centre of town on the busiest time of the week). As a bit of a wallflower this was a strange thing for me to do, as I obviously looked mental covered in paint and people did stare. But instead of feeling embarrassed I wore my race number with pride and had a sense of accomplishment as the sun followed me all the way home. Perhaps that paint really did have magical powers?